Just returned to Seoul this afternoon from a beautiful mountainside farm in Hongcheon, a few hours outside of Seoul (by train and bus). The owner of the farm, Gaeguri, is not only a natural farmer, but an author on the topic as well. He was also one of the first in South Korea to take up Natural Farming. Suhee, Chakuri and I had a very peaceful visit with Gaeguri and his family, eating some amazing food from his garden — and even a few things picked off the side of the road — and capturing lots of wonderful imagery. 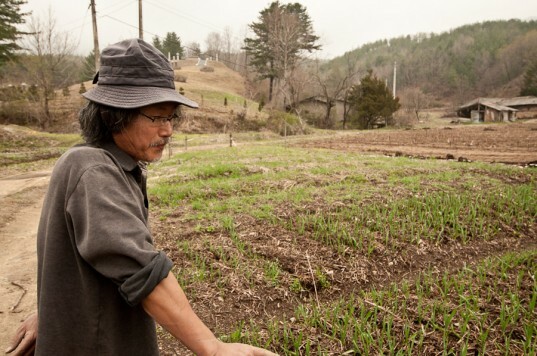 Because we’ve already done an interview with Gaeguri previously, the conversation this weekend centered around what has and has not worked, and how the natural farming philosophy could be adapted to different climates, and even urban areas. Gaeguri is also helping us get in touch with other Natural Farmers, both in Korea and Japan. I’m planning to be in Seoul until Friday, when we’ll head out to the next farm. I’ll take advantage of that and visit Namdaemun Market tomorrow to pick up a few camera related items. Hi, my name is Rosann O. Spetti, and I have been working on a Natural Agriculture farm for over 3 years now. It is a Shumei Natural Agriculture Farm. It is known as Santa Cruz Farm, in Santa Cruz, CA. We do not use any pesticides, herbicides, or fertilizers of any kind. We have a genuine respect for nature and we let nature be our guide. NATURE CAN TEACH US EVERYTHING!! We do till, but we have the Shumei Philosophy in our hearts. Shumei is a spiritual organization that believes in Natural Agriculture, Art and Beauty. It is spiritual farming at its best. Please come and visit our farm, Patrick, we will be happy to give you a farm tour. We have much in common with Masanabou Fukuoka. Only we till. We have a Natural Agriculture book out called “Spirit of The Land” written by Dr. Diana Jerkins, USDA, and she is a Shumei Member. Thank you for reading this. We hope to hear from you soon!